Making America Great Again Don’t Sit and Watch, Be Prepared! Don’t Sit and Watch, Be Prepared! While growth and making America great again are the goals of all working Americans, the unwinding of massive debt, troubled banks and over a decade of bad policies will prove difficult and may come with severe pain for unprepared citizens - especially retiring baby boomers. The new policies being presented by President Trump are badly needed, but history shows they could also be a catalyst for much higher gold prices for many reasons. As Mr. Trump has stated, he needs to drive the dollar much lower vs. the Chinese Yuan in order for us to compete with China and for his new trade policies to be effective. His goal of halting corporate outsourcing of labor to foreign countries could be extraordinarily inflationary and may end up creating an awkward, complex, or hazardous situation for corporate earnings. With the dollar currently near 14-year highs, we cannot afford for it to move any higher; or even to remain near current levels. The dollar is often a mirror image of the price of gold (if the dollar goes up, gold goes down). The last time the U.S. dollar was this high, gold was trading near $300 an ounce. In recent months, gold has performed unbelievably well in the face of a massive dollar rally driven almost entirely by the Euro crisis and China manipulating its currency. Under Obama our monetary base quadrupled, while the velocity of money (money being spent and changing hands) declined by over 50%. This indicates the hoarding of massive amounts of cash by banks, corporations and individuals. When a nation needs a lower dollar in order to attract businesses and rebuild plants, inflation occurs. Corporations and large investors know not to hoard cash in that environment as it will begin to loose value and buying power rapidly. Today interest rates remain at historically low levels. Low bank yields indicate continued banking problems and an uncertain economy. Low yields and a shaky banking complex worldwide are not a smart place to keep savings when inflation is rising. The U.S. Treasury has the legal authority to devalue the dollar, the Fed does not. Expect a heated confrontation between Janet Yellen and Trump. Future statements from the Fed about government policy could become more standoffish as she begins to realize his goal of lowering the dollar’s value. As Mr. Trump moves the U.S. away from free trade agreements, investors’ return on capital could also fall. Domestic labor should begin to gain, but any gains likely will not exceed the losses in capital income. If losses to capital income become large enough, even labor could lose. Lower returns on capital should lower real interest rates and lower the dollar – just as we witnessed the British Pound fall after the Brexit vote. Before the election, Trump stated emphatically that the U.S. dollar is “too strong.” He warned that a soaring greenback has “disadvantages” for U.S. companies which do a lot of business abroad. The stronger the dollar, the more expensive U.S. products are in markets with cheaper currencies. This will lead to lower sales worldwide, less profit for U.S. companies and fewer new jobs. A strong dollar, he told The Wall Street Journal, is “killing” U.S. competitiveness in places like China. Trump is pro-business to the extreme and wants to boost U.S. manufacturing and exports. A declining U.S. dollar will make U.S. manufacturers more competitive. That is what is needed in order for his policies to succeed. Mr. Trump has also said he may massively boost tariffs on China to level the playing field. Such a move could instantaneously increase consumer inflation. If the U.S. were to move back onto a gold standard, as President Trump said he favors, respected economist Jim Rickarts estimates gold prices would need to rise to $10,000 per ounce. David Hargreaves, a widely watched mining consultant, has calculated the price of gold could even rocket to $40,000 per ounce, based on world GDP figures (roughly $100 trillion). 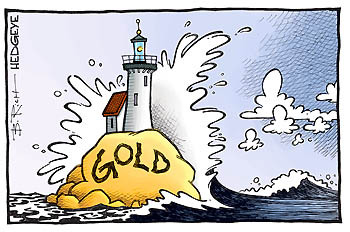 Because gold and the U.S. dollar move in opposite directions; when inflation rises, gold soars. It is also vitally important to remember that physical gold has no counter-party risk or issuer risk. Gold has always been the ultimate non-investment; a simple, sound, store of value money to preserve wealth - unlike government-issued currencies which float (or sink) in an ever-deepening ocean of debt. It’s very much unprecedented to hear a President support a weaker dollar. As of this writing gold is up over 5% in January alone. Prepare for an increase in geopolitical uncertainty and a massive currency war. Inflation-proof your portfolio today. Both gold and silver prices could easily skyrocket over the coming years. The real question today for baby-boomers and those entering retirement is: can I afford not to put some of my IRA or savings into gold? The gold standard was crucial in making America great. It brought prosperity and justice to all. I believe gold is vital in helping make America great again!